Cut, schmear, eat, repeat, enjoy! Living in Collingswood has many benefits. It's a beautiful walkable town. The borough hosts many fun events. 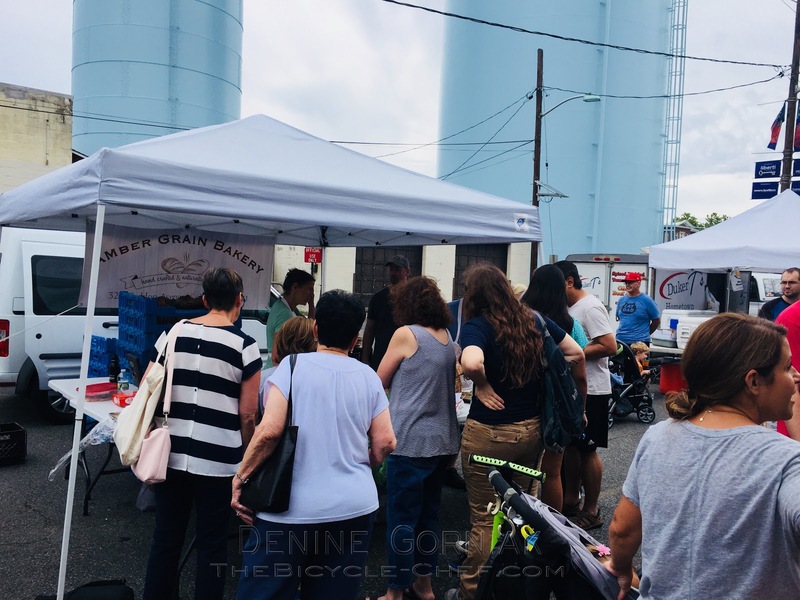 We have one of the best dining scenes in the Tri-State area, and most importantly for me, we have the best farmers' market around. 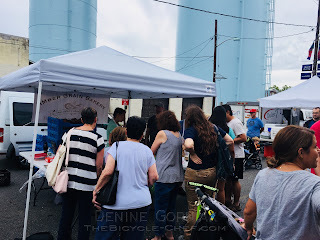 Writing for the Collingswood Farmers' Market has been a blessing to my blogging as there is always a story to hear, new foods to discover, and many warm and engaging people to meet. 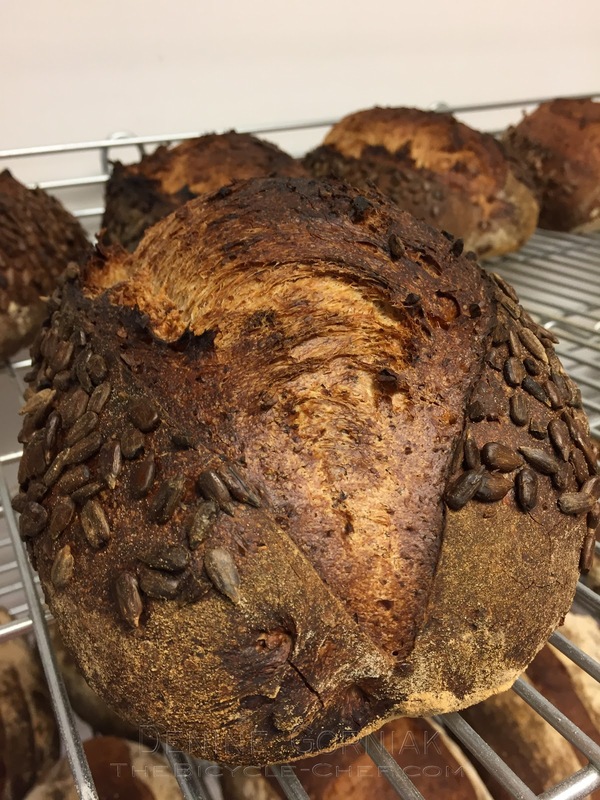 The owners of Amber Grain Bakery, Stephen and Franziska (Franzi) Kramer, are two people whom I've gotten to know over the past year by being a customer in their store as well as at their wildly popular stand at the market. 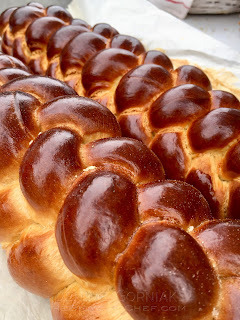 Their store, Amber Grain Bakery, is located at the far end of town, nearer to the Camden/Collingswood border, at 325 Haddon Avenue near Coulter Avenue and Browning Road. Lucky for me, I live at that end of town, so their store is in my neck of the 'Wood. 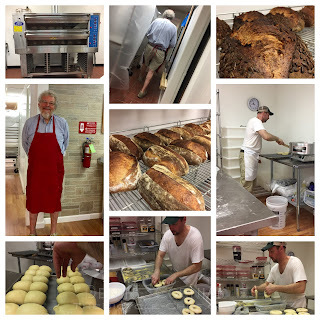 In the year and some months since the Kramers' have opened their village German-style bakery, we bread/carb adoring fans have been treated to bagels and bialys; enriched and burnished brioche and challahs; bee sting cakes and rugelachs; hearty German pretzels and thin crust pizzas; potato and onion, sunflower seed, and Collingswood sourdough loaves; just to name a few handfuls of the fantastic leavened heaven that Stephen makes. If you don't get up early enough on Saturday and Sunday, you just might be left with an empty bread basket as the store and the stand sells out of bread quickly. Bagels are a quick seller. Many a morning friends and I have been bereft of our Saturday schmear! 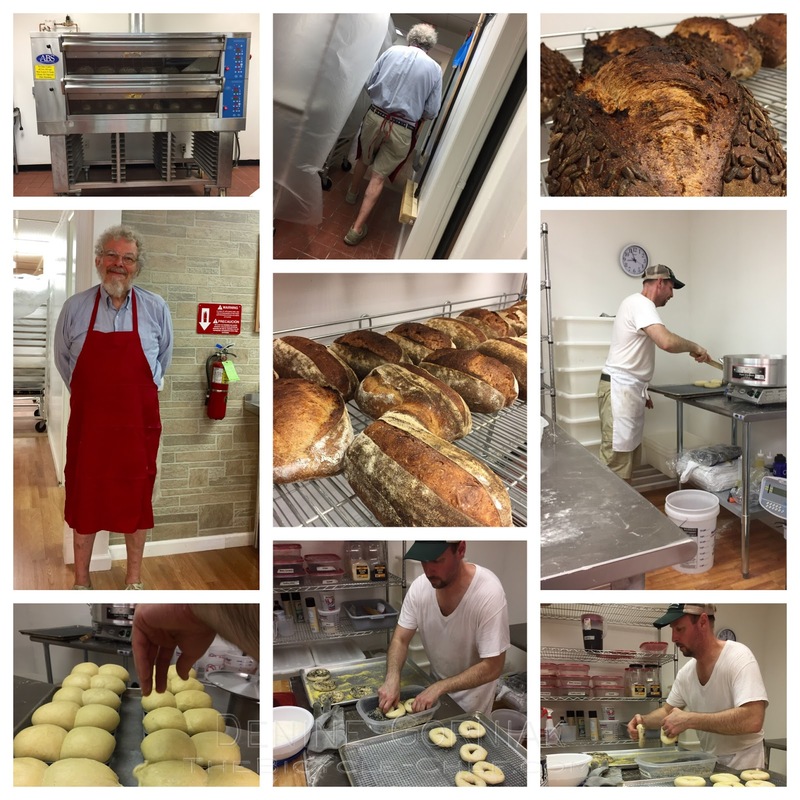 A benefit of living so near to the bakery is that you can see Stephen in action preparing all the dough, breads, cookies, cakes and other treats. 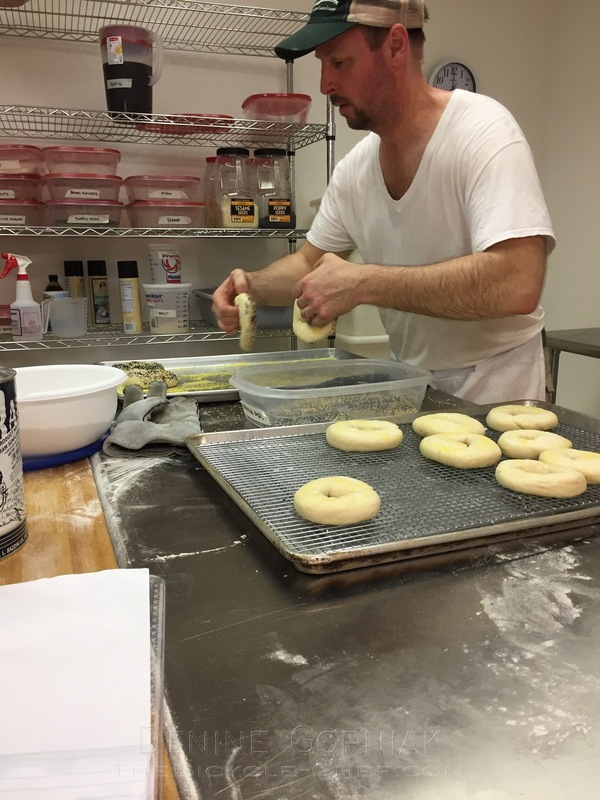 Over the past year, he's gone from a one-man baking operation to hiring other bakers and workers in the store, so that they can prepare all the baked goods for the coming week, with a heavy emphasis on making the dough and products for the Saturday Farmers' Market. Stephen said that he spends early Thursday morning to Saturday morning getting production ready for the Farmers' Market. Other days of his packed week are devoted to starting the process all over again. Stephen has graciously allowed me to pop into the back bakery area and talk with him while he portions out bagel and bialy dough; proof loaves; roll out rolls. His manner is sure and steady and his calm demeanor is firm, much like the hearty loaves of sourdough he meticulously makes each week. Having spent time the bakery admiring Kramer's handiwork I've gotten to know both Stephen and his German-born wife, Franzi. We've shared war stories about our jobs, interests, and culinary passions. When I first started going into Amber Grain, Stephen was working full-time in the science and engineering side of the food production industry. His wife works full-time at a law firm. We would talk about what truly interests us and how to write that next chapter of your life. Stephen and Franzi have their stories written. Me? Well, I'm still trying to figure out the keyboard let alone what I want to say, write and do...but every time I talk to either Franzi or Stephen they ask me how it's going and if I'm ready to write that next chapter. I'm getting there albeit very slowly. It's been a joy to watch the bread and friendship bloom over the past two market seasons. 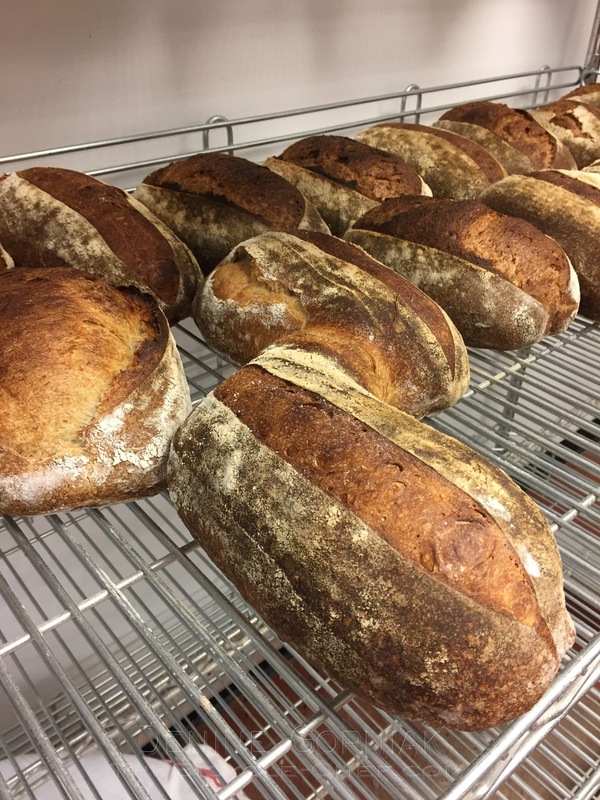 Stephen's philosophy of recreating an old-world village bakery has come to fruition and Collingswood is enriched by his endeavors. Stephen's breads get better every week. 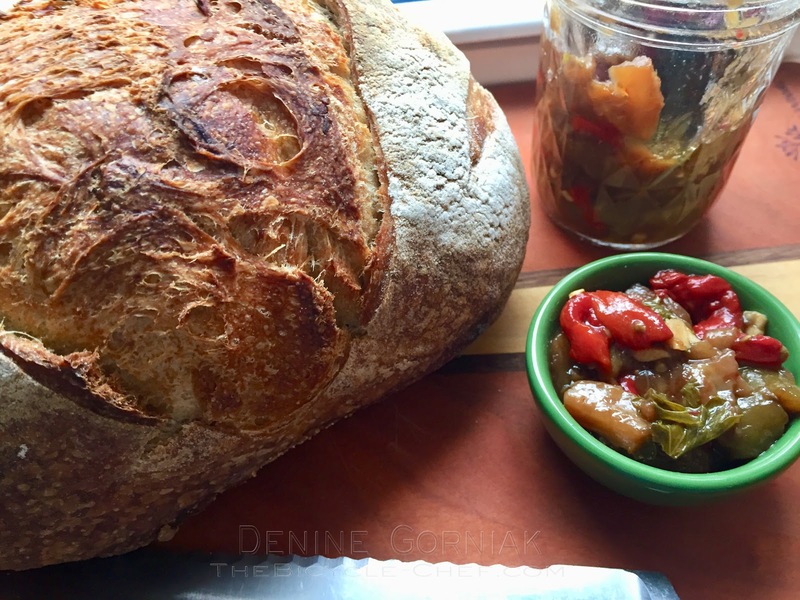 When we talked a few weeks ago, he told me that he's constantly experimenting with his grains and flours. He is toasting or sprouting grains and rye seed to bring out complex flavors. Sourdough starters have a unique Collingswood flavor profile. 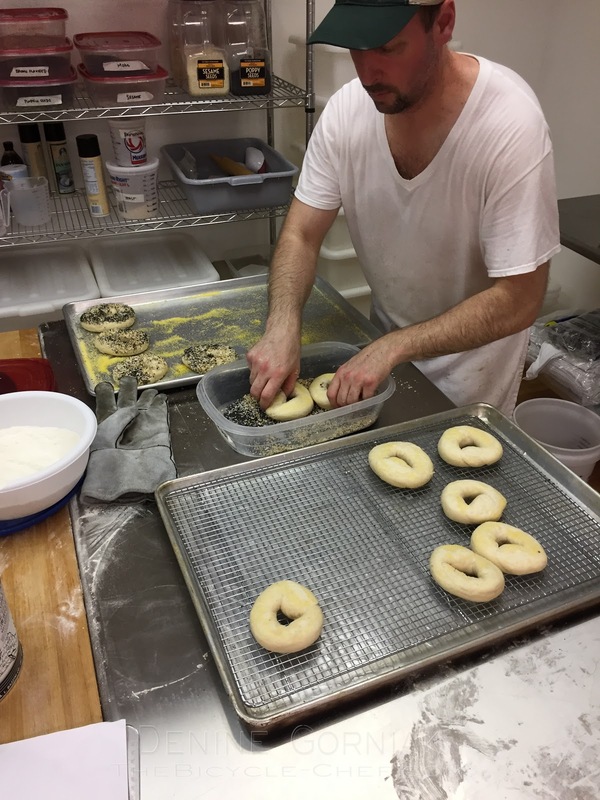 Bagels are becoming works of art. His baguettes are Germanic in their crisp and toothsome quality. When I buy a loaf of bread, I try to save some for later in the week by cutting it up and freezing it. My favorite thing to do with Amber Grain breads is to share it far and wide with friends. 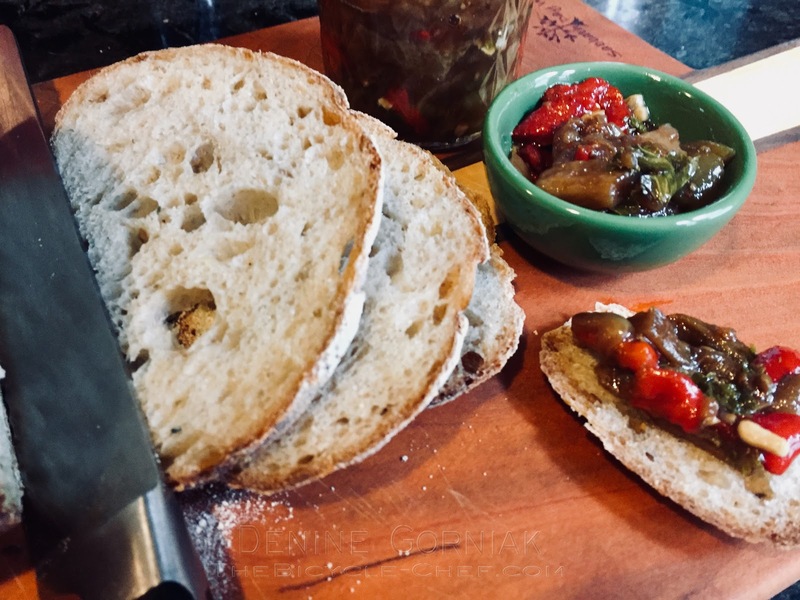 The loaves make a great base for doing a toast bar spread, as evidence from my Mother's Day Toast Bar Brunch post (find photos and ideas here!) Over loaves of bread a friendship has developed, full of nuances and flavor. The Kramers have counseled my weary soul with gentle encouragement, hearty advice, and a lot of bread of life. Looks like a great bakery! Next time I am in Collingswood, I will definitely be getting some bread or bagels. It is a great bakery. What's so interesting is that when I first moved here 6 1/2 yrs ago, we had no bread bakeries in town. Now we have 2 very good bakeries, each with a different style. I really love the German style breads and Stephen's olde-world village bakery idea. I wish he could be open every day of the week but love that he's doing a great business with his two days.